The Baby-Mee is designed to accommodate children from the age of four to nine months and weighing up to 10 kg. 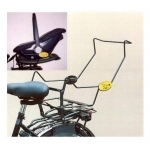 It works with almost all commercially available child seats for cars, offering a sprung ride, and must be fitted on a rear carrier with capacity of 25 kg - preferably with NEN(14872) certificate. 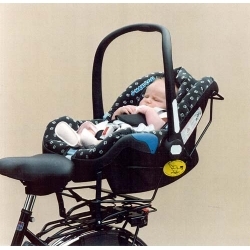 The Baby-Mee relies for safe operation on being fitted correctly to the bike. Instructions are provided. 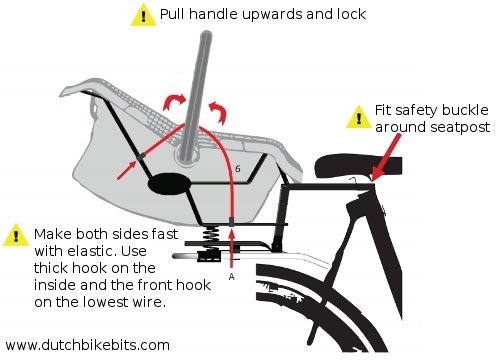 If your child seat does not fit correctly into the Baby-Mee or the Baby-Mee does not fit properly on the rack on your bicycle then your child could be in danger. Please do not take risks. Neither DutchBikeBits nor Steco can take any responsibility for damage as a result of an incorrectly fitted or used child seat. 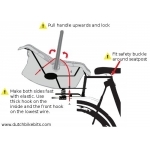 We have translated the Dutch fitting and usage instructions into English in order to help customers to fit and use the seat correctly. However, while many thousands of Dutch children start cycling in this way without any harm, transportation of your child by bicycle is of course at your own risk.